In a recent post, Natural Gas: Weekly Storage Analysis and More, I highlighted several fundamental reasons to be bullish natgas at some point over the next couple of months. The key phrase here is "at some point". All of those reasons I mentioned in that post are still valid. And at some point natgas will stage an explosive rally, squeezing the shorts for 20-25% in the matter of a day or two. 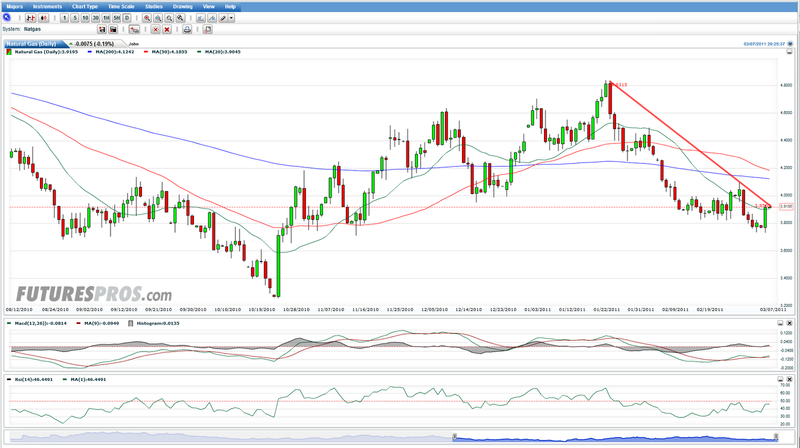 The question is does that rally start from 3.80? Or 3.20? Or even lower? The prompt contract certainly put in an impressive performance today, rallying as much as 5.5% from the overnight low of 3.73 to a high of 3.93. However 3.93 puts the contract right up against the declining trendline that's been in place since January. Until this trendline is broken, and quite frankly until price starts to trade back up above its 50 and 200 day moving averages, the odds still favour selling rallies. The UNG chart looks even worse, with multiple levels of resistance between 5.20-5.30 including a declining trendline, the 20 day moving average and the Oct 2010 low. There are some possible bullish signs, such as the RSI and the MACD starting to turn up, but I think it's more than likely that this rally fails like every other attempt so far this year. 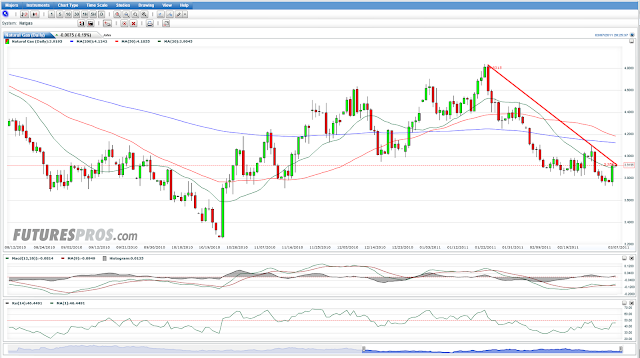 And with a stop above 5.30 a short offers great risk/reward here with an inital target around 4.75. Now I've read some forecasts calling for a colder than normal spring, but winter is basically over. And while supplies are not at record levels I suspect that without frigid cold temperatures (like we experienced this winter) driving demand we could start to see some fairly bearish storage numbers released by the EIA over the next several weeks. As well, the NOAA forecasts for the 6-10 day and 8-14 day periods show warmer-than-normal temperatures in the northeast US which is a big driver of heating demand in the winter. I went long the leveraged natural gas bear ETF HND.TO @ 10.06 this afternoon. 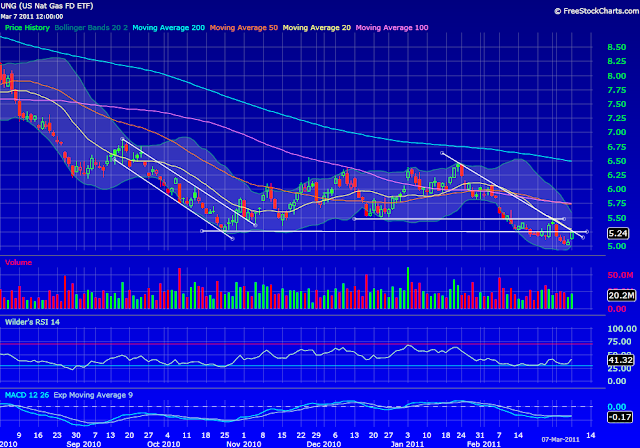 This trade, like a short in UNG, offers a great risk/reward profile with a stop above the 20 day moving average.